'Watson's, admirable place of education though it may be, filled my childish soul with loathing. The only part of my school life that I cared about was the approach of the annual school games. At only one of these was I allowed to compete, although I was a scholar there for nearly five years. Once I was prostrated by a severe illness, and again, while taking part with some youthful companions in some races beforehand, I strained my heart, and my mother, backed up by the doctor, forbade me to run. I remember the latter occasion well, though it is as long as 13 years ago. My mother, to make sure, hid my "running things". Nothing daunted, I went down to the ground and tried to borrow some. My efforts proved unsuccessful, and upon my presenting myself for the "100, under 14," in my ordinary clothes, I was indignantly asked where my "uniform" was. Not liking to admit that it had been hidden by my fond parent, I invented some excuse, which, however, was of no avail, and I was requested to remove myself from the track. I did. I went home and wept bitterly. At Watson's, nevertheless, I pulled off my first race. In the year of grace, 1885, I won the 100 yards for boys under 13. 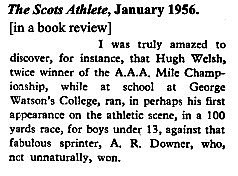 The year after I ran in the Inter-Scholastic Sports, which were open to all Scottish schools, and again proved successful, breaking the tape two yards ahead of another Watson's boy, one Johnny Curry by name. GRAMMAR SCHOOL SPORTS by "OLD BOY"
The Portsmouth Grammar School annual sports were held on the Men's Recreation Ground on Friday, in lovely weather, before a large number of spectators. 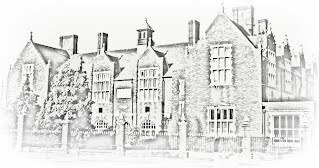 The Grammar School have turned out many a fine runner, the most famous, perhaps, of all being A. R. Downer, the champion sprinter of the world, who was educated at the old School, and won several races at the School Sports at the early age of twelve. In The Scotsman for Saturday, July 21st 1888 it was recorded that in the Prize List for Session 1887-88 of the Edinburgh Institution, for Classical, Mathematical, Commercial, and Scientific Education, “A.R. Downer, Jamaican” secured Honorable Mentions for his attainments in Mathematics and English. SAAA Championships: 100 yards, 220 yards and 440 Yards - first triple Scottish Champion. Became professional. Holder of the World Professional Record for 400 yards in 44.8 sec, won at Bolton, 6th February, 1897. 2nd Institution v. 2nd Grange – At Portobello. This was the opening match for the Institution, and after a hard-fought game, they won by 3 goals from tries. Cook, Downer, and Begg scoring, the first-named doing the needful.